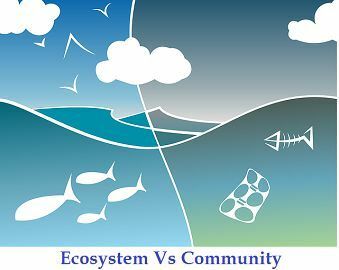 The basic difference between Ecosystem and Community is that Ecosystem consists of various communities which include living as well as non–living components interacting with each other, whereas interaction of different individuals of populations of different species living in a particular geographical area is called Community. The community consists of only biotic factors only. Our Earth is the only planet comprising life from the microscopic organisms to the large animal.To understand life better with its management, activity, and organization, it is mandatory to know about the few terms like biosphere, biomes, ecology, community, population, and individual. Among them, there is a heap of confusion between Ecology and Community, as they have a very thin layer of difference but matters a lot. So with the help of this article, we will try to differentiate between the two along with a brief summary. components), it is a kind of link between them for the exchange of energy and biogeochemical cycling. Community consists of the group of populations of different species living together and interacting with them in a region. Example A forest, an estuary, a pond, a grassland. Like different species birds (Darwin finches) living in the same area, also another example is animals, plants, bacteria living in the same environment. Includes Ecology includes all the components of biotic (living) and abiotic (non-living) factors. Community includes biotic factors only. Changes in the Environmental factors The ecosystem does not change with any affecting conditions though it transformed into another ecosystem. The community may change with changes in the environmental factors. Ecologist defines ‘Ecosystem is the atmosphere where biotic and abiotic factors interact with each other.’ Here biotic factors include all kinds of living beings like small microorganisms to the big one, interacting with non-living factors which involve sun, river, ocean, mountains, rocks, clouds, etc. Ecosystems can be of different sizes and can be terrestrial, aquatic or marine. Ecologist uses two parameters which are resilience and resistance; Resilience is said when there is a disturbance in an equilibrium of the ecosystem, Resistance is returning or the state of equilibrium of an ecosystem. Producer: These are the main energy producer, which prepare their own food with the help of sunlight. The best example is plants which produce their food with the help of sunlight and photosynthesis. Consumer: These types totally depends on producer directly or indirectly for the food. Examples are animals. Decomposer: Their best examples are bacteria and fungi, which decomposes the materials and convert into soil. All living thing varies with one another in different aspects, but it’s not easy them to survive alone hence need a support of others. Therefore community can be defined as interactions of living organisms (biotic components) with different types of species living together in the same environment as well in a particular region. The community is a part of ecosystem only, which consist of populations of different types of species together. There is the level of hierarchy which is followed to reach the top level called ‘Biosphere.’ The biosphere is the point where all the biomes, ecosystems meet, and it is a sum of all the factors right from the individual level to the biomes. An Ecosystem is an interaction of both biotic (living) and abiotic (non-living) components these link can be due to the exchange of energy and biogeochemical cycle whereas Community has an interaction among the populations of biotic components only which can be of same or different species living in a particular area. An example of Ecosystem includes a forest, a pond, an estuary. An example of Community can be said like a flock of birds (Darwin finches) living together or when different species of plants, animals, microbes lives. An ecosystem consists of living as well as non-living components interaction; The community consists of only living components interaction. The ecosystem does not change with changes in an environment rather it transformed into a new one; Community interaction may change with changes in an environment. Biosphere consists of all significant levels which include entire things of the earth right from individual to biome and is well organized; it is the combinations of all the ecosystems, community. As we all know that individual can’t grow alone, everyone depends on each other for one or the other things. As above discussed an ecosystem is the diversity of many communities of organisms where they interact with living (biotic) as well as nonliving (abiotic) thing whereas community contains the variety of populations of different species linking with each other in a region.